An independent release filled with deep rewards for Anglophiles and power pop fans. As musical genres go, power pop is sometimes maligned, but most often ignored, its fans part of a small subculture of little interest to major labels. Yes, there are some exceptions, the Knack and the Romantics having hit the top of the charts with sublime pop gems, but consider that Cheap Trick, arguably the greatest power pop band of their generation, has had a spotty chart history when weighed against their reputation and took half of forever to get inducted into the Rock and Roll Hall of Fame. And let's not forget that Big Star, power pop's Velvet Underground, still languishes outside the Hall and probably always will. From a pragmatic standpoint, there's not much reward in playing power pop. But then, the thing is, to those devoted to it, a perfectly polished gem of a power pop single that hits all the right notes -- sublime harmony, sing-along chorus, chiming guitars, bass-driven beat -- is reward enough in itself. 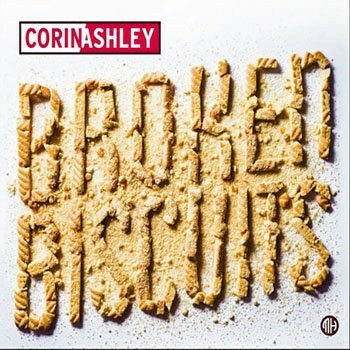 For Corin Ashley, a former member of Boston's the Pills, the release of Broken Biscuits, his follow-up to 2013's New Lion Terraces, must feel particularly rewarding, considering he almost died while making it. After serving as touring bassist for Cardinal and contributing to former-Boo Radley Martin Carr's The Breaks, Ashley had about half of the record completed, including a duet with Tanya Donnelly (Throwing Muses), by the end of 2015. Then, in January 2016, Ashley suffered a stroke that left him with paralysis of both his left hand and his vocal chords. It took a year of constant work to relearn how to play guitar and sing, but by 2017 Ashley was ready to return to his unfinished album. The result, Broken Biscuits, is one of those out-of-left-field, independently released albums that should find its way onto quite a few year-end "Don't miss this one" lists, especially among power pop purists and Beatles-obsessed Anglophiles. For such, Ashley is definitely a member of your tribe. Album opener "Little Crumbles" is a classic piece of power pop whimsy, filled with crunchy guitars and psychedelic signposts with Ashley belting out in his instantly-endearing, McCartneyesque wail. The ghosts of Beatles songs past haunt this album, creating reference points that add to the record's enjoyment and amplify the strengths of Ashley's pop sensibility. "Broken Biscuit #3 (ampersand castles)" evokes McCartney's Ram track "Uncle Albert/Admiral Halsey", while "Edison's Medicine" calls to mind "Maxwell's Silver Hammer". But Ashley's is not a derivative art; rather, he revels in twisting familiar riffs and tropes to serve his mad scientist-like creativity. Think of how the Beatles' musical language has pulsed through the ears of the several generations of pop musicians that followed them. They created what has become a common language, and it is possible to make something completely personal and new from such a shared musical lexicon. When Ashley sings "There's a hole in my head where the rain gets in", he is, of course, referencing "Fixing a Hole", but he is also taking a line that he has internalized through a lifetime of listening and turning it to a completely new and highly personalized purpose: describing the experience of the stroke that nearly killed him and his long road back. The familiarity draws us in, then, when Ashely sings "Then the big, big weight came down on me and left me in tatters", we find ourselves in a completely new place, whimsy being twisted into a life and death struggle. This is how we connect to music: our favorite songs become a part of us. An artist deeply rooted in a tradition, like Ashley, can use common elements of that tradition as raw material for a completely new and evocative piece of song art. This is a cornerstone of folk and blues; pop's history is not nearly so long, but it, too, is ripe for its next generation to make the familiar unfamiliar again with new twists and interpretations. "Borrow a song if you must do," he sings in "Magpie Over Citadel", as if tipping his hand to such inspiration, "but sing out to the sky / Dance to the moment ‘cause we are gone in the blink of an eye." In other words, if it moves you, then it becomes a part of yourself. Life is finite while our greatest songs touch on immortality. As a master student of Beatlesque pop and its subsequent history, Ashley fits comfortably among that traditions major stylists. His witty word-play calls to mind XTC's Andy Partridge on songs like "King Hollow". Singing "I'm King Hollow working to ensure that nothing changes until everything falls apart", Ashley evokes Partridge's own "Here Comes President Kill Again" while offering a winking nod to current politics. "Wind Up Boy", which features that duet with Donelly, sounds like an outtake from XTC's alter-egos the Dukes of Stratosphear. And there are ample Jeff Lynne-like big sound choral and symphonic elements throughout the production demonstrating that Ashley, whose previous record was partially recorded at Abbey Road, knows his way around a studio. Ashley's inspirational story of recovery turns out to be only a small part of Broken Biscuits' many charms.